2 MOVSZISZIAN , KAREN 6.5 SANT ANDREU C.E. 3 ALARCON CASELLAS, ROLANDO 6.5 TORA C.E. 5 CERVELLO TOST, FERRAN 6 PEONA I PEO, C.E. 7 SIMON PADROS, EMILI 6 TERRASSA DEL CSC, C.E. 12 PEREZ GARCIA, ADRIA 5.5 PEONA I PEO, C.E. 13 SAGUILLO GONZALEZ, ORIOL 5.5 CERDANYOLA MATARO C.E. 15 TOUZANE , OLIVIER 5.5 FIGUERES C.E. 16 SANPERA BONET, JUAN CARLOS 5 CATALONIA C.E. 18 MOYA ARAU, CARLES 5 PEONA I PEO, C.E. 20 BAUTISTA SANCHEZ, JOAN 4.5 SANT ANDREU C.E. 21 VIÑALS RIOJA, JAUME 4.5 CONGRES C.E. 22 FABRE MASSANA, MIQUEL 4.5 MOIA MOIANES C.E. 23 MASACHS VENDRELL, FRANCESC 4.5 CATALONIA C.E. 24 PRATS RODRIGUEZ, JOAN BOSCO 4.5 SANT BOI C.E. 25 CAPELLADES SUBIRANA, MARC 4.5 PEONA I PEO, C.E. 26 CODINA CALVO, DANIEL 4.5 PEONA I PEO, C.E. 27 MENAC COMAS, JOAN RAMON 4.5 CATALONIA C.E. 28 MASDEMONT SERRA, GUILLEM 4.5 CATALONIA C.E. 31 RIBERA SELLARES, PERE 4 CATALONIA C.E. 32 SIMON DEL SOL, JAUME 4 MOIA MOIANES C.E. 33 CORRIGUELAS ARMILLAS, FREDERIC 4 PEONA I PEO, C.E. 36 PLANELLA SANCHEZ, JORDI 4 ESPLUGUES L'AVENC C.E. 39 COLLELL RODRIGUEZ, VICTOR 3.5 PEONA I PEO, C.E. 40 BLASCO CUSIDO, FRANCESC 3.5 VALLS C.E. 42 GIBERT JUAN, RAMON 3.5 FOMENT MARTINENC C.E. 43 POU SALLES, RAMON 3 TARADELL, PARC D'ESPORT C.E. 44 POVILL CLAROS, LAURA 3 PEONA I PEO, C.E. 45 GIRONA MASDEU, JOAN 3 SELVA DEL CAMP, LA C.E. 46 TEJERO ROYO, FERMI 3 CONGRES C.E. 48 POVILL BATLLE, RAMON 3 PEONA I PEO, C.E. 49 BARCELO SOLA, DAVID 2.5 SANT JOSEP DE BADALONA C.E. 50 VARGAS DRECHSLER, CARLOS 2.5 TRES PEONS C.E. 51 RIERA SOLA, LLUIS 2.5 AVINYO C.E. 52 SERRALVO MARTINEZ, JOAN ANTONI 2 BERGUEDA C.E. 53 CERDANS COSTA, FERRAN 1.5 SANTPEDOR C.E. 1 MATONS CALAFI, EVA Mª 7.5 VALLS C.E. 2 CAMPRUBI I JUANOLA, JAUME 7.5 BANYOLES, C.E. 3 CREIXANS COMERMA, POL 7 LIRA, LA C.E. 4 AMBROS PLADELLORENS, JORDI 6 BALSARENY-SALLENT U.E. 6 ESCOFET LLONGUERAS, JOAN 6 TERRASSA DEL CSC, C.E. 7 VEGARA GALLEGO, PERE 5.5 TARADELL, PARC D'ESPORT C.E. 10 MOLINA MAÑAS, MIQUEL 5 PEONA I PEO, C.E. 12 ROSSELL ARAN, JOAN 5 PEONA I PEO, C.E. 14 VARGAS RODRIGUEZ, GABRIEL 5 PEONA I PEO, C.E. 16 CAMPRUBI I JUANOLA, JORDI 4.5 BANYOLES, C.E. 17 PLANELLA ZAVALA, IVAN 4.5 ESPLUGUES L'AVENC C.E. 18 CREIXANS COMERMA, MARTÍ 4.5 LIRA, LA C.E. 19 FEBRERO PEREZ, LLUIS 4.5 COMTAL C.E. 20 BOSCH RICART, JOAN 4.5 TARADELL, PARC D'ESPORT C.E. 21 LLAURADO PLADELLORENS, CATERINA 4.5 PEONA I PEO, C.E. 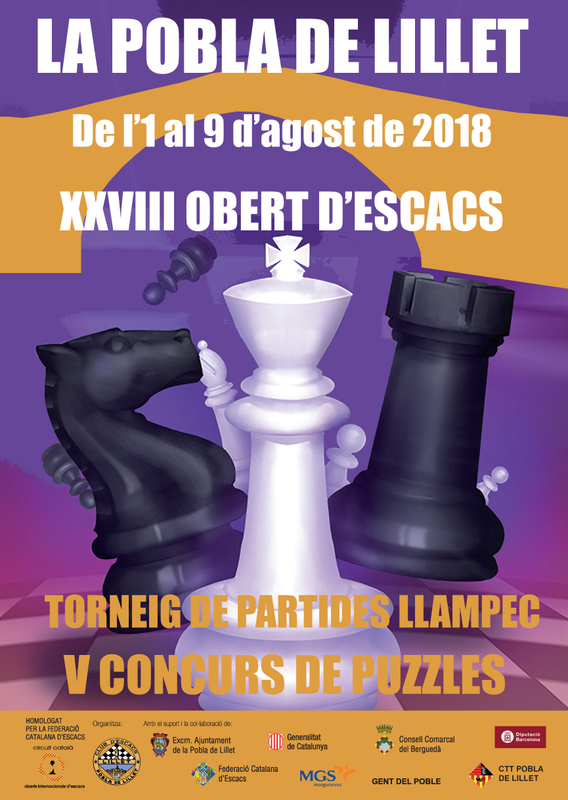 22 SOLSONA MANONELLES, JOSEP 4.5 CAPABLANCA C.E. 23 ROVIRA CHACON, Mª MERCE 4 SELVA DEL CAMP, LA C.E. 26 MARTINEZ ARRANZ, NAGORE 4 PEONA I PEO, C.E. 29 FRANCH BESSA, JULIÀ 3.5 SANTPEDOR C.E. 30 JUNCOSA PADROS, ERNEST 3.5 PEONA I PEO, C.E. 31 GARCIA PITARCH, RAUL 3 MATARO C.E. 32 PLANELLA ZAVALA, IRENE 3 ESPLUGUES L'AVENC C.E. 33 PIFARRE GENE, JOAN BAUTISTA 2.5 TRES PEONS C.E. 35 DURO SOLE, RAMON 1.5 PARDINYES, C.E. 37 CAPELL GUIX, SANTIAGO 1 SANTPEDOR C.E.